Making her final crossing tonight from Wemyss Bay to Rothesay, the CalMac car ferry BUTE will remain at her 'home' port tomorrow due to industrial action by pier staff at Rothesay Pier. 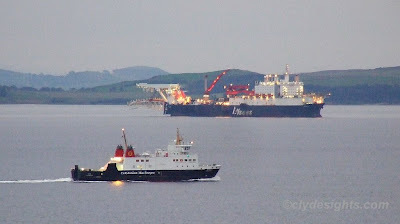 In the background, the pipe laying ship SOLITAIRE remains at anchor off the north end of Great Cumbrae, awaiting repairs following the loss of part of her equipment off the western Irish coast. I'm guessing that it was a wee bit darker when the photo was taken? Did you go up one of the roads behind Wemyss Bay to take the picture? The picture was taken from the back of Innellan, around 7:10pm. Ooh. I thought it looked like it was taken from the other side of the river. The solitaire was the biggest pipe-lay barge in the world when she was reconstructed on Tyneside in the mid ninties. 6 years ago she was operating in the Mexican gulf area. I was on the support vessel that was working with her.